Emerging market currencies is a subject I tend to stay away from, its not my particular area of expertise and others can cover the subject far more eloquently: check out Sid Verma on Euromoney who really knows his Rands from his Rupees. Recently this changed when I was asked for my opinion on Bitcoin by a UK based financial institution, which in turn got me thinking about the virtual currency’s specific appeal to emerging markets. It’s fair to say Bitcoin is a subject which divides opinion, ranging from those who think it is a Ponzi scheme, to supporters who believe it represents the future of the global economy. Throw into the mix its relative newness, mysterious origins and uncertain future and we have the recipe for dozens of wildly contradictory opinions out there…. Note: Bitcoin refers to the decentralized public ledger which allows payments, while bitcoin refers to the currency unit itself. Bitcoin isn’t the only big currency story at the moment; the fall of emerging market currencies against the US Dollar and to what extent this will damage these nations growth prospects has dominated the business pages in recent months. Although the Federal Reserve “tapering” is taking the blame this time round, emerging currency collapses are a recurrent problem of the last few decades and often represents the biggest macro risk faced by those investing in emerging and frontier markets. At the same time, the rise and rise of virtual currencies, primarily Bitcoin but also others such as Feathercoin, Ripple and Litecoin has given hope that a new frontier in currency use is being created, which may help address these issues. The increasing use of virtual currencies provide a glimpse into a future where international currency transactions are not only painless and free, but in which exchange risk is massively reduced thanks the emergence of a widely accepted neutral international currency. Bitcoin can act as both a reserve asset, accessible to all, but also as a trade and investment currency, free from capital controls or government interference and excess inflation. Bitcoin is not owned or controlled by anyone (other digital currencies often work on similar principles) but is a decentralized peer-to-peer payment network, operating through open source software and sharing a public ledger called the block train which records every transaction ever processed which also allow a user to verify the validity of payment. This system also makes it impossible to double spend bitcoins. The currency “exists” as pair of cryptographic keys, one private, which acts a safeguard and the other public which acts as verification. 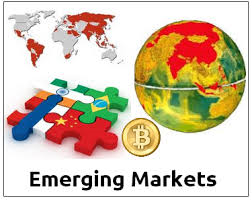 Bitcoin and other virtual currencies could make a stronger impact in emerging markets than developed markets. Kenya helped to pioneer virtual currency use through the M-Pesa mobile banking system and the peer to peer trading quasi-currency of airtime phone minutes. The prospect of being able to store funds securely away from the prying eyes of government and potentially risky banks will be filling many emerging markets entrepreneurs with delight, while the frictionless/borderless aspect will interest those engaged in international trade. Those who have witnessed or have dealt with sudden drops in the Rouble, Rand or Peso will understand the pain and expense of EM devaluations, and could view Bitcoin as a useful hedge against local currency collapse. At the same time these advantages will be viewed by many in government with fear, allowing individuals to bypass capital and government control is not something many (particularly authoritarian) governments will be too pleased about. Therefore it is no surprise that Russia has threatened to ban the currency and China has banned the Bitcoin – Yuan trade by banks in the country, their governments citing their (undoubtedly true) use in money laundering and criminal activities. Other countries such as Singapore have recognised it as an asset (which can be taxed), others like India have held back from regulation, but recently Indian law enforcement raided the offices of companies that trade in bitcoin thanks to money laundering accusations. The way bitcoin is produced or “mined” see here for a detailed explanation, means that it requires ever more heavy duty (expensive) computing power, so that in the future only those with serious money, i.e. banks, hedge funds, ultra high net worth individuals and even governments will be able to produce more bitcoins, creating a printing press for the already rich. Volatility: the swings in value of bitcoin which have been up to 50% in one day against the dollar, negate its use as a store of wealth or trade currency. To be fair the bitcoin “economy” is valued a just US $10 billion, a rounding error in daily global trade and currency movements, so greater use and acceptance will help to reduce these wild swings in value. Limited acceptance: if you offer up a virtual wallet of bitcoins in New York or Nairobi or when you want to pay for a coffee you are likely to be faced with a blank stare followed by some embarrassed shuffling while you look around for some “real” change. Only a few (mainly online) outlets accept bitcoin. Again this is changing with more mainstream companies like Virgin Galactic now accepting bitcoin (helpful should you be a bitcoin millionaire wanting to go into space). However many of places that do accept it, take it for banned/illegal goods – which creates a major image problem. The closure of the notorious Silk Road site (a marketplace for illegal goods) and seizure of the website’s illict bitcoins by the police was one event which helped the currency gain the column inches in the press last year. Speculation: the popularity of Bitcoin has seen it move from a libertarian dream/internet niche into the realm of speculators trying to get rich from it, this is a scenario which rarely ends happily in the long run and has led to accusations that the whole market has turned into a Ponzi scheme. Bitcoin offers a tantalising promise of a new currency and asset class which can help facilitate trade and allow entrepreneurs to protect themselves against government intervention and mismanagement, but I personally believe the unknowns and downsides are too risky. However I will be studying the many other alternative virtual currencies with great interest, as I do think they have a future as an asset class, if a currency can overcome the issues above then Bitcoin could one day be a historical curiosity and another virtual currency could instead be a major force in international finance.